"A wise man climbs Fuji once. Only a fool climbs it twice." 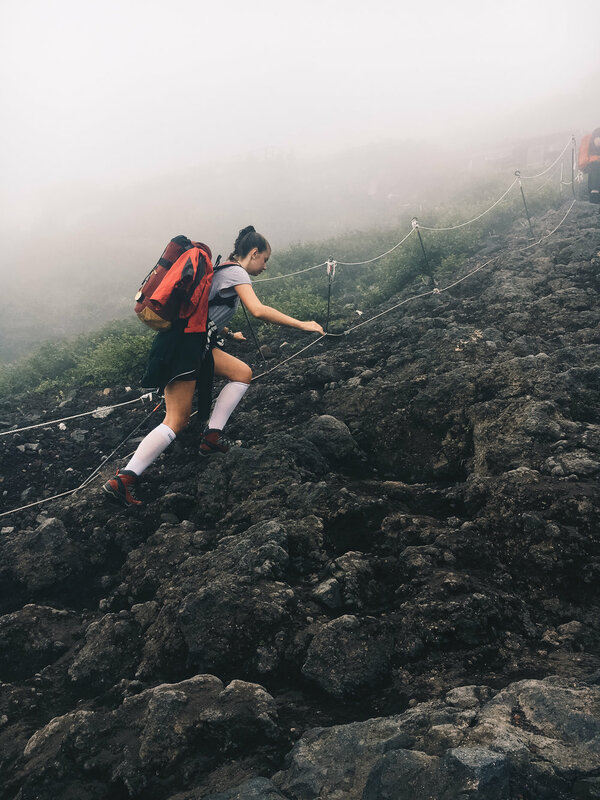 We spent our last 48 hours in Japan climbing the famous Mt. Fuji. The idea definitely was not mine, but when my friend suggested it, I immediately said 'yes'. I mean Mt. Fuji? That “hill”? Easily. Well, I couldn't have been more wrong. Even though the Fuji seems small, it is a 3776 m high mountain (the highest one Japan has to offer), closed for hikers during the winter months and still an active volcano. But by the time I realized what I had gotten myself into, it was already way too late. I am definitely not the most active person on earth, but still, I went hiking a lot when I was little and while doing our research we soon discovered that the Fuji (get used to me calling it THE Fuji or even ‘the mister’, don’t ask me why, I started that during our trip) is in fact climbable even for not extreme hikers. There are several huts and lodges on the way up, where you can sleep for not too much money, but we decided not to book one as we intended on climbing it in one go and then waiting on top for the sunrise. The sunrise is what the Fuji is famous for and we later realized why. Our adventure started in a weird way, as we had to postpone it because of a little mishap of planning, as we realized in Kyoto. A few days later we heard that on the day we first planned to climb it, there was horrible weather and in fact a warning of heavy storms on the mountain. So, we decided on finishing our trip with this experience instead of hiking in the middle of the trip. We took a bus from Tokyo that brought us to the so-called ‘5th step’ or ‘5th station’. You can actually start climbing the mountain from the ground up, but that takes you way longer and honestly, if you’re not Reinhold Messner or the most skilled hiker on earth, I recommend you start at 5th station like everyone else as you will need the energy later on. The bus was about 2 700 Yen, we decided not to buy the return ticket in advance, as we did not want to have to rush down the mountain. We had to wait an hour as the first bus was full when we came back down but that was really no trouble at all. We took the Yoshida-Trail, which is the most famous one. It is about 6 km long and at the starting point a sign tells you it’s about 6 and a half hours to the top. As soon as you start making some metres of altitude there’s a separate way for going down, as it gets really steep and it was quite dangerous when some people ignored the signs and thought it was a good idea to simply turn around and climb back down the way that was meant to be climbed up. We decided on making a 5-10 minute break every 20-30 minutes, as we did not want to power out by starting too fast, which was a really good idea. It was a very foggy day that, very soon, turned into a rainy day, which made the whole climb much harder. While the first hours were pretty doable, after some time we started feeling the altitude and it started getting colder and wetter. Also, the trail started getting harder. While we were able to walk casually in the beginning, after some time we had to use our hands to climb the stones. At some point it started raining so hard I even put away my GoPro, as I was afraid it might get damaged. Of course, you are not climbing that mountain alone. Huge numbers of tourists as well as Japanese are making their way up to the top, but we were way faster than most of these groups. At one point, it started getting dark and the rain was unbearable, so we tried finding a place in a hut for shelter during the night. It was not too far from 9th station, but they told us they were full and that we should turn around to go to the hut that was a little further down. In front of the sign that said “0.9 km to summit” there was nothing we wanted less than turning around, but the host kept telling us we had to turn around and the hut farther up the mountain is not available, so we had no other choice than to turn around. During the night it kept raining cats and dogs, so we were glad we made that decision. The “night” lasted about 4 hours, as we were woken up at around 2 o’clock to get into our clothes that were still soaking wet from the day before – until now we’re surprise we didn’t catch a serious cold from doing so – and started climbing up the mountain with hundreds of other people that were trying to make it until sunrise. After half an hour or so, we found out why the host the day before told us to turn around and not go to the next hut – the hut wasn’t there anymore! We heard it got somehow flooded and completely washed away by the heavy rains a few weeks before our climb. After a while, there were little men standing next to the trail, waving light signs and shouting “Keep going! 10 minutes until summit”. And boy, did I hate these guys for lying as I heard that phrase about 4 times on different levels of altitude and none of them were true. When we reached the summit, it was still dark. My head was pounding, and I wondered if I might lose my toes as it was so freezing cold, and everything I wore was still wet. I went inside the hut for a bit as I felt like freezing to death. Then, the sun started to rise, and we realized why everyone told us we had to see the sunrise on top of Mt. Fuji. Honestly, I can’t quite describe the feeling, but the sun just made up for everything. Being above the clouds and knowing it was me, not a cable car, that brought me where I was standing was incredible and as soon as the sun had risen completely, all of the trouble was forgotten. I saw the endless clouds beneath me, the lightly smoking grounds and I was just so happy and relieved. We waited for the other climbers to take their photos and as soon as they were rushing down the mountain to catch their bus, we started taking our pictures and after resting for a little bit longer, we slowly started our descent. I know you might think the story ends here but what came then was the most horrible part of the trip. As the Fuji is a volcano, the grounds were like gravel and gave in easily. You felt like taking a hundred steps just to walk a metre. Also, my knees are definitely not made to walk downwards for that many kilometres and after a few hours I simply wanted to cut off my feet. About a kilometre from the finish I felt like crying when reading signs of how far we still had to go, but somehow, I made it. Climbing Mt. Fuji was definitely a special experience and despite feeling like dying several times when doing so, it was the right choice to climb it. 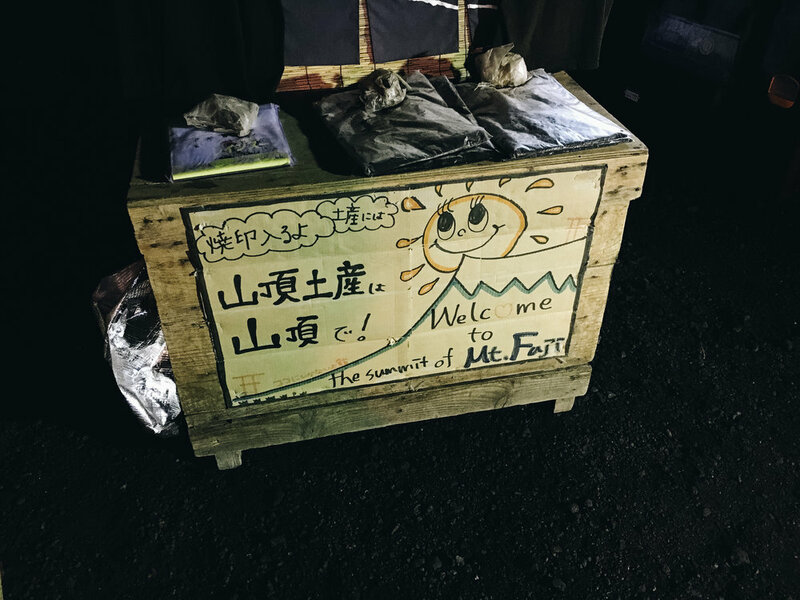 It did show me what I am capable of and proved to me that, in spite of some people describing me as lazy at times, I am able to climb Japan’s highest mountain without any special preparation. If I were to do it again (believe me, I won’t do so!) I’d definitely prepare more and if the internet tells you to book a hut – BOOK A HUT! Just because I was able to climb it, doesn’t mean it is easy. Many people on top wore Oxygen masks as the altitude can really be rough and even I, living in the heart of the Alps and having been on high altitudes many times in my life, struggled with it. 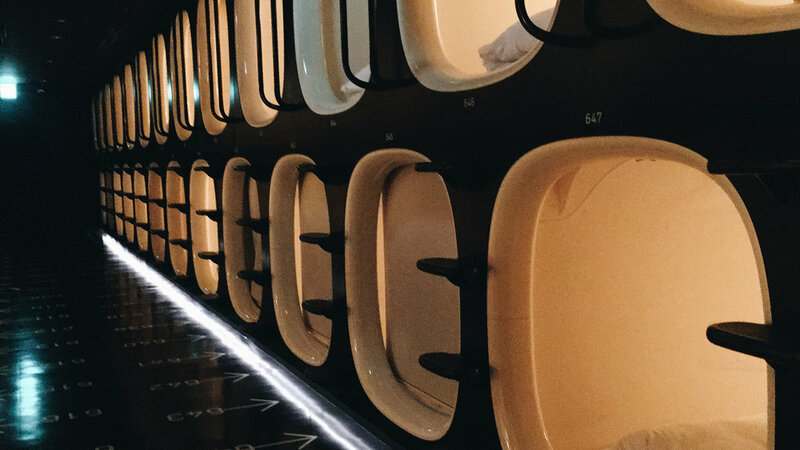 Before heading home, we stayed another night in Tokyo, this time in a capsule hotel in Shinjuku. I am sure you have already seen pictures of those hotels. At first it felt really weird, like in a film, but I can assure you that it was such a quiet night; those hotels are so tidy and modern, I’d definitely sleep in one of those again! I hope you enjoyed my little Japan-series and, hopefully, you now want to visit Japan as much as I want to visit it again (a new trip might already be in planning). I can only once again highlight how much I am in love with this country (more than ever) and if you have any questions I’d be happy to help you or give you some advice.